On the dental front the news is both good and ongoing, three appointments down and another one to go on Monday morning. The dentist is the lady of many hats, she doesn’t have a receptionist or a hygienist or even someone to just sweep around. She does the lot all on her own, which we assume is why its taking four appointments as doing the whole thing in one go would be difficult with popping out to answer the door or phone when she is mid filling. Iain says its like stepping back in time and visiting a dentist 40 years ago – all a bit 1970’s and not too modern but still well able for a bit of teeth pulling. We do think that she is fairly free and easy with the anesthetic, it’s at least four or five hours before it wears off after each visit, by the time he can eat again it’s nearly time to go back. The big question of cost has been resolved, €200 all in, we think that is an absolute bargain as the last time I had a root canal done at home it was over £400. Our insurance will pay for €50 (after the excess) so it could have all been a whole lot worse. Before we came away we actually did hum and hah as to what the contingency fund should be and whether we would need one at all. After new windscreen wiper motor, a Kindle and a fairly heft dental bill it was a good call to have one and seems madness we considered not keeping the money separate and including it in the weekly spends. It seems relatively fair now that as I spent a good chunk of it on an electronic book and Iain has now spent a similar amount on keeping his teeth, that’s us even. As our movements had been curtailed for the latter part of the week due to above it was lucky for us then the weather had been pretty well tip top on Thursday and Friday. The only way to describe it was it was like being in Greece! No, like you expect Greece to be all blue skies, slightly foaming seas and a bit of a mountain haze. Up to now we have seen a fair bit of rain but with good blue skies in between. For the latter part of this week it was actually warm too and we have been sitting outside for a few hours in the afternoons. There were still some cloudy patches but overall things have been on the up. Then we read a certain blog that said there is a forecast of snow this coming week in the Peloponnese! 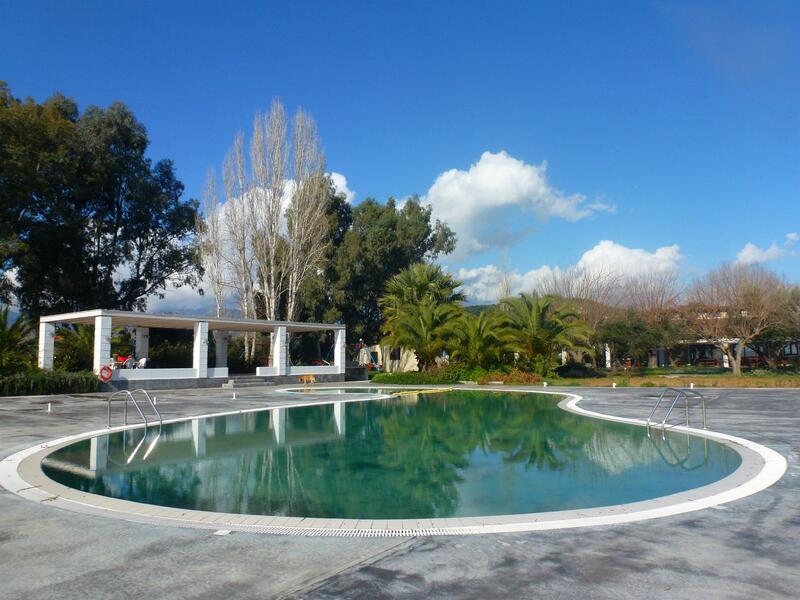 We did not sign up for snow in Greece, we came for sunshine so someone in charge of the weather needs to be taking a look at themselves and sorting it out as soon as. Surely this isn’t a prelude to snow? Gythio has become very familiar to us over the last couple of weeks, we have our regular shops and even our own parking spots on the edge of the promenade which is very handy for town. Our favourite bakers is a charming little shop where said baker employs his mother at front of house. I am sure she is just as charming as her son but she evidently hides it so much better. A request for bread is met with a look that says – can you not see I am busy talking, when I have the cheek to ask for a cake too she slides into meltdown. Yesterday I offered a €5 and you would have thought it was a €500 – she waved it around shouting what I assume was to the effect who the hell has any change. Two customers emptied their pockets and began counting out coins, slight mayhem but worth it for the entertainment value. There isn’t what you would call a great selection of shops in town, hardware shops are plentiful, as we have found everywhere in Greece. Clothing shops are at either end of the spectrum, there is a large ‘fashion house’ that sells clothes no one under the age of 120 would be seen dead in. Then there is a very modern and expensive chic little boutique a couple of doors away alongside a very nice shoe shop, that’s the end of any retail clothing therapy. And no matter what the shop and how expensive or cheap, and pretty much every cafe or bar there is someone in every one smoking a cigarette. They say its stereotyping to say all Greek men smoke, its not – they do and pretty much everywhere you go. Saturday afternoon was a bit overcast so we headed back over to Dirou to see the caves we had missed earlier in the week. 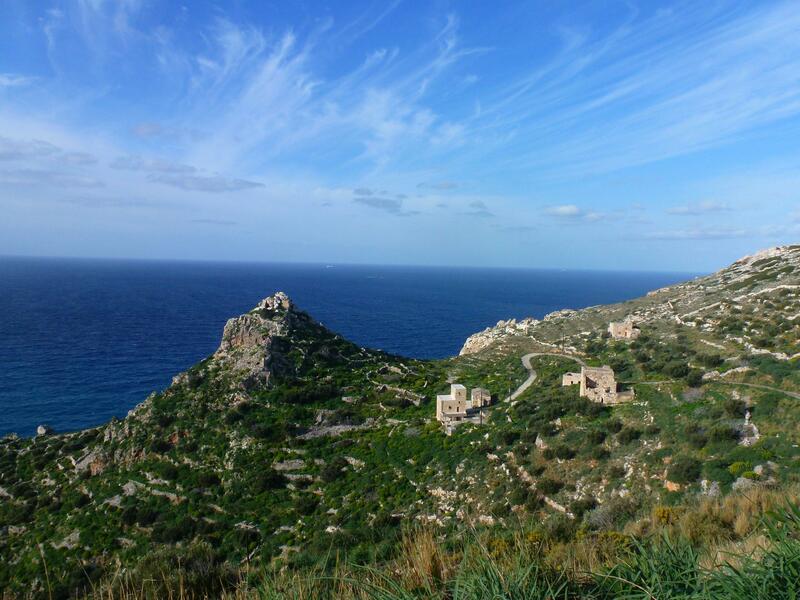 It was a choice of the long route around the Mani, a couple of hours, or the shorter new road over the mountains – less than 30 minutes. We took the mountain route, despite it being the newer and main road we hardly saw any traffic. The views over the Taygetos mountains are spectacular and make the journey worth it for those alone. Over the last week or so we are beginning to see the wild spring flowers carpeting the countryside. 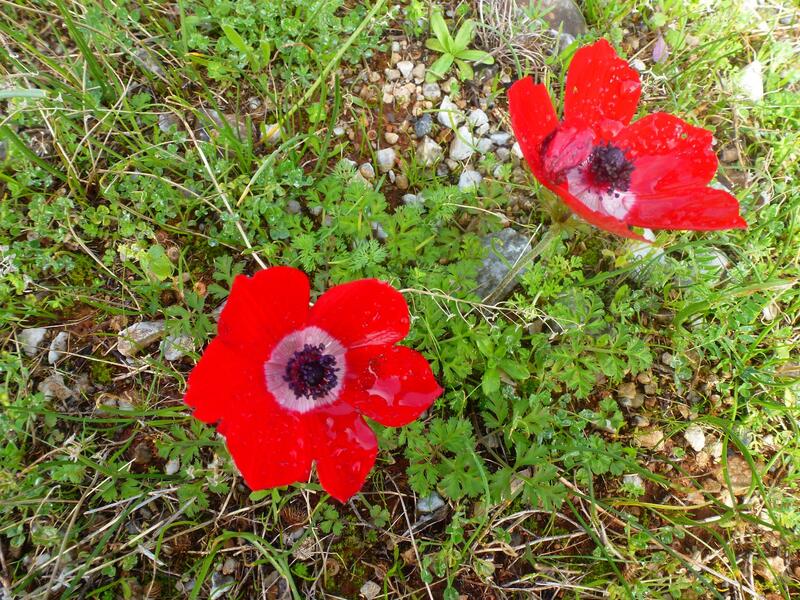 Whilst it is only February the wet weather means it is growing season for wild plants and flowers, the red anemones that are spreading over the mountains are truly a gorgeous sight. Back ar Dirou and there are over 14 km of caves that have been charted over the last 50 years, usually a Venetian canal boat takes you on a 30 minute trip through the cave system and then you walk the final 10-15 minutes. It is even open all winter and the trips run throughout, well they usually do. For some reason the day we visited the boat wasn’t running but the lovely lady at the kiosk told us we could still go in and pay just €5 instead of €15. As this sounded a bargain we agreed, paid and were waved off around the cliff to enter at the normal exit. From there it was every one for themselves, no guides, no real idea of how far to go and no one giving out the hard hats and life jackets all neatly stored on the wall. 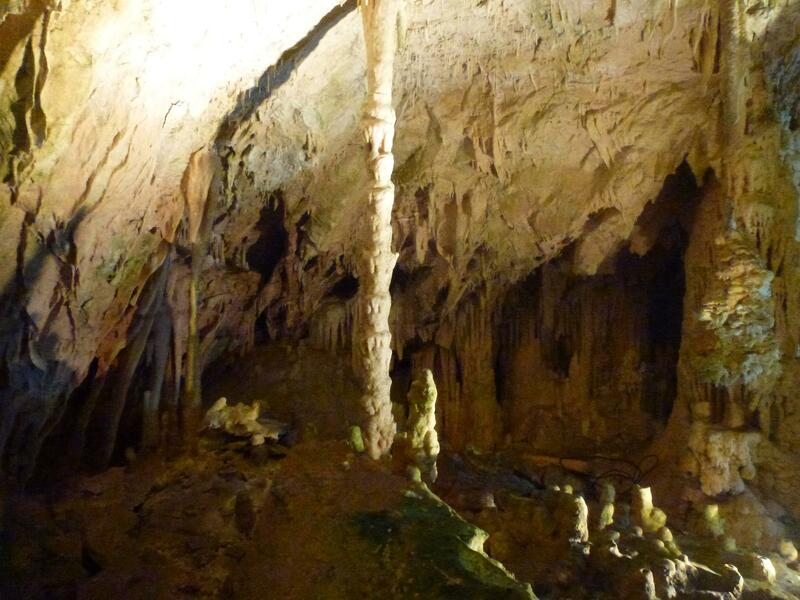 For me they were caves with stalagmites and stalactites and some fairly low level lighting, pretty much what you see at most caves type places. We walked about a kilometre and then it started to become very wet underfoot, there was nothing to say turnaround other than if you didn’t you were going to walk through six or seven inches depth of water, so we gave up and walked back. For us, worth €5 yes, not sure what you would see on the boat that would make it threes times better? 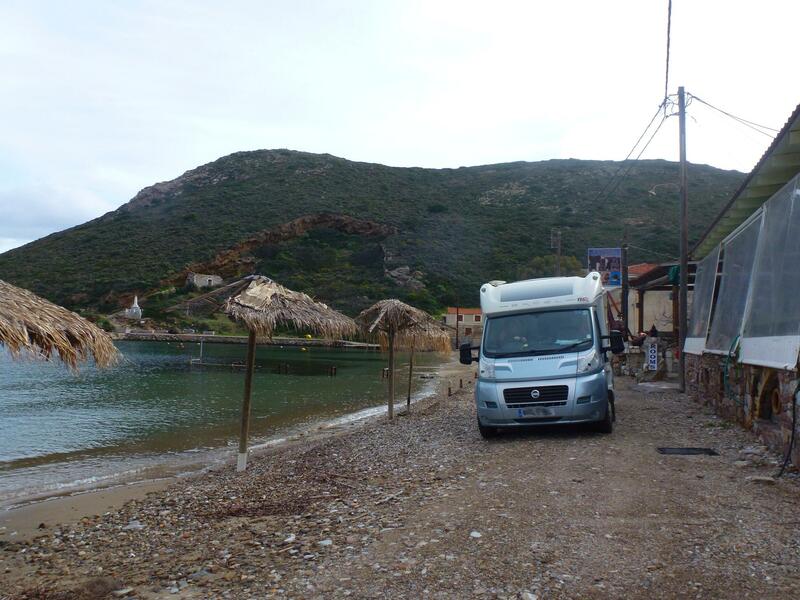 We cannot speak for the whole of Greece but the Peloponnese really is an amazing destination for motorhomes. For those that want to wild camp there are plenty of places tucked away and it seems at this time of year no one really minds, although it is illegal to wild camp we find that popping into a nearby cafe, buying a couple of coffees and asking if its okay is always met with a smile and a nod. Likewise people are happy to give access to their internet for the price of a cuppa. We have found a few places where local business have put signs up pointing motorhomes towards car-parks, to be fair that seems to be because some have parked outside hotels and restaurants and you can see that would annoy you if you had paid for a beautiful sea view to have it blocked by a great big white tin can. I guess that Greece is far enough way from Northern Europe that it is never going to be as accessible as Spain or Portugal so will never experience the mass migration of the winter grey nomads seeking out some sunshine, to that end the Greeks can afford to let people stop overnight here and there and know its not going to have a snowball effect. This afternoon we were joined on site by the wonderful Roland and Claire (aka The Wanderlings), who are currently taking a longer break than us and travelling Europe without an end date. We follow their blog and usually try and avoid their routes as they tend to attract atrocious weather (totally honest – they parked opposite us and within an hour there was hail!!). A really lovely afternoon / evening spent discussing campsites, top spots to visit, motorhomes and all the other stuff that would probably be totally boring for non motorhomers. It’s a very strange sensation to meet people who you have never met before but you know so much about them, and they so much about you. Thank you both, it was really good to finally meet up, and its been an absolute joy to get to know you both a little. We look forward to catching up again somewhere later in the year, obviously if you are still dragging poor weather around we may have to re-think but hopefully the sun will be with you by then :). 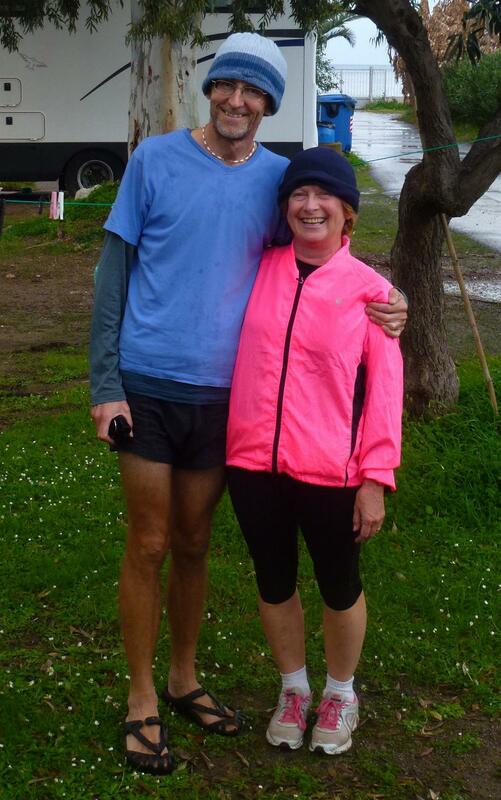 the very lovely Roland and Claire – they really do run in the rain all over Europe! Iain is going to be able to claim to be part Greek from this week, thanks to new fillings and root canals courtesy of a very lovely lady dentist in Gythio. The previous filling was left somewhere in Italy and Iain was planning on taking the risk as to whether he could survive the next 10 months with a gappy tooth. We decided it wasn’t a great risk to take so on Tuesday morning he had an appointment to replace the lost filling, two hours later he re-appeared with a temporary filling and three more appointments for a root canal! Dentist said a filling would not last until we got home so she wanted to do the full works. I believe she had big windows and saw us coming but we can’t take the chance so himself is toughening up as if a temporary filling takes two hours, lord alone knows how long a root canal over three visits is going to be. Due to the forthcoming suite of dental appointments our plans for the Mani were curtailed down to two days. To be honest if we had had two months we could still have stayed longer, whilst I have said I will not continue to say everywhere is amazing, incredible etc. etc in the case of the Mani it would be wrong not to say just how gorgeous it is. 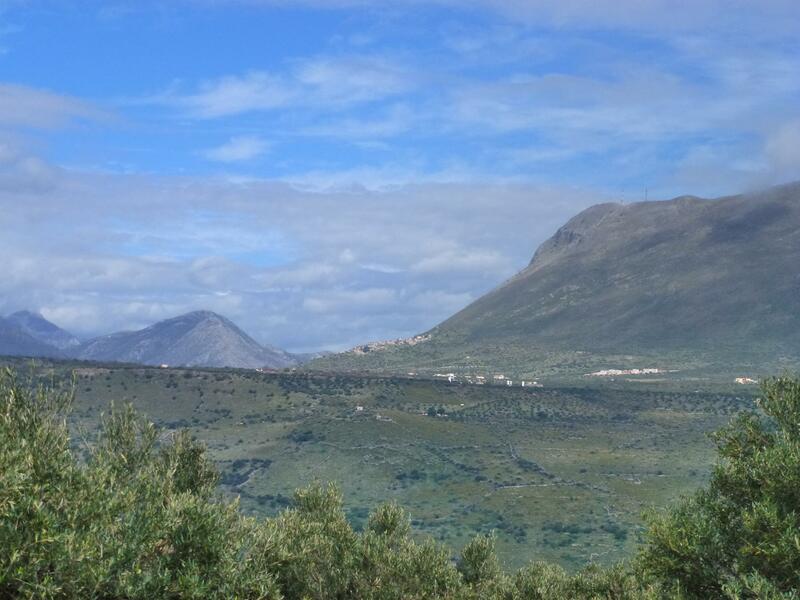 Whilst it is the most rural part of the Peloponnese that doesn’t mean there is less to see, far from it. 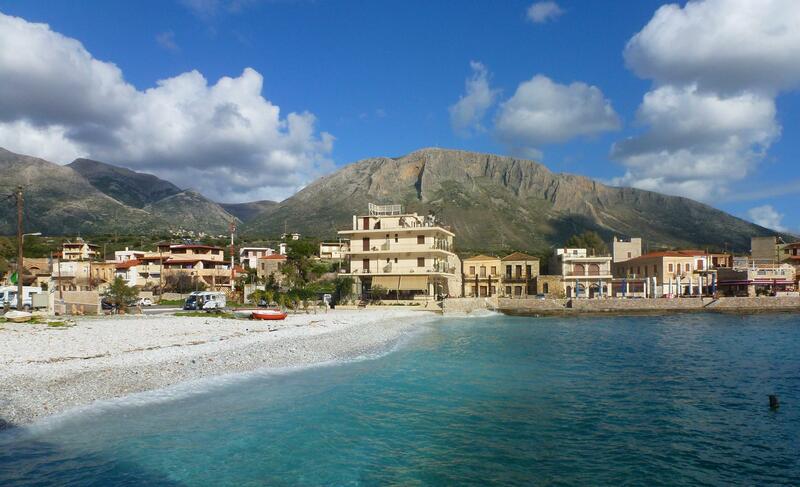 The area and the people are known as the Mani, which translates in English to the either ‘mania’ or ‘full of rage’, luckily for us everyone was the usual super Greek friendly, rage is not a word you can see being used that often here. It wasn’t that long ago that many of the villages could not be reached unless by sea. Nowadays there is a winding road up and down each side of the peninsular and its a bit of a tourist attraction in the summer months. From the main road there are numerous small lanes at every turn which lead down to small harbours or to tiny fortified villages. Many of the houses are refurbished original fortified dwellings and there are still plenty of ruins just waiting to be snapped up. Just as many are new builds though, I guess its easy to be a tourist and not like the new stuff but this is partly what is bringing people back to live in the area so sometimes the new has it value even if it doesn’t look anywhere near as good. The peninsula is split in two by the mountains running down the spine. We crossed over at the top to Aeropoli and took the anti-clockwise route. The caves at Dirou were high on our list to visit but as the sun was out and the sky was blue we both felt that dark and dank caves were not essential to the day. Aeropolis itself seems very like most of the modest towns in the area, plenty of min-markets and not much else. The road running down the East side is fairly straight forward, through some lovely villages but nothing to write home about. 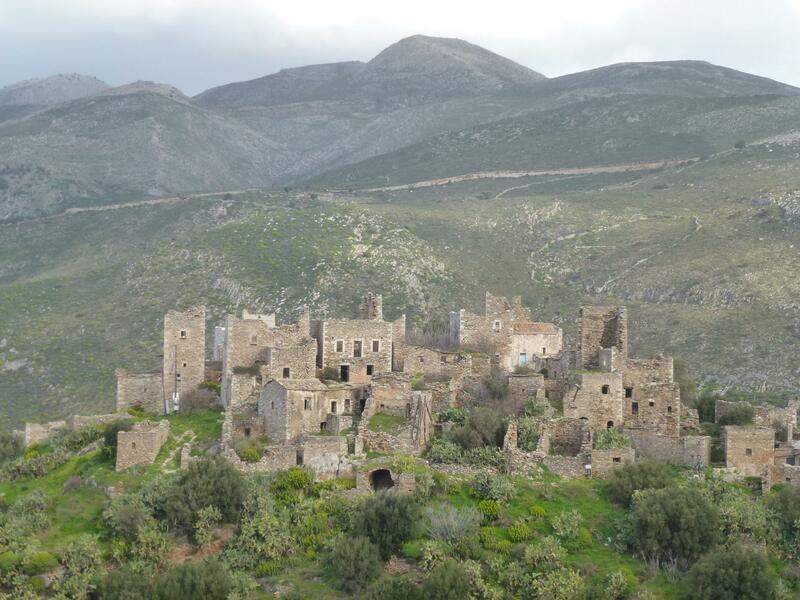 We stopped off at the village of Koita where there was a good mix of ruins, beautifully restored Mani type dwellings and a fair few sympathetic new builds. There was one newish small road around the edge of the village but the old footpaths and cobbled alley ways are the main routes to most of the houses. Of course wandering around out of tourist season we stuck out like a sore thumb but everyone without exception had a smile or a wave for us. 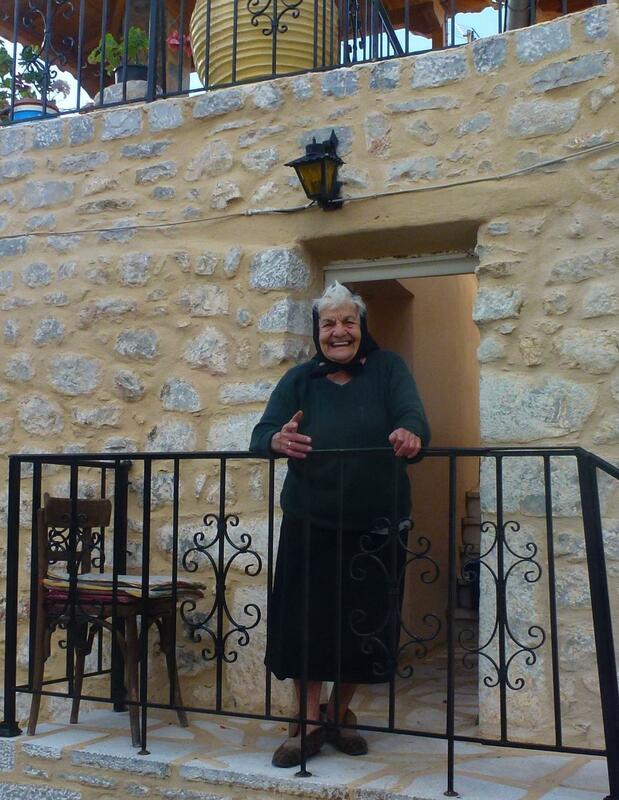 As we wandered around we came across a lovely Greek lady sat on her steps who called us over for a chat, we had a conversation of sorts with her pointing out that her house had been rebuilt 10 years ago. We went through our outstanding Greek repertoire of wishing her well and telling her where we are from, to which she replied in Greek, we guess something of the effect of, “ah British, is that why your husband is one skinny sod, let me get you something to eat”, she then disappeared into her house. A few minutes later she emerged with a massive smile and an equally large paper bag full of almond crisp biscuits. 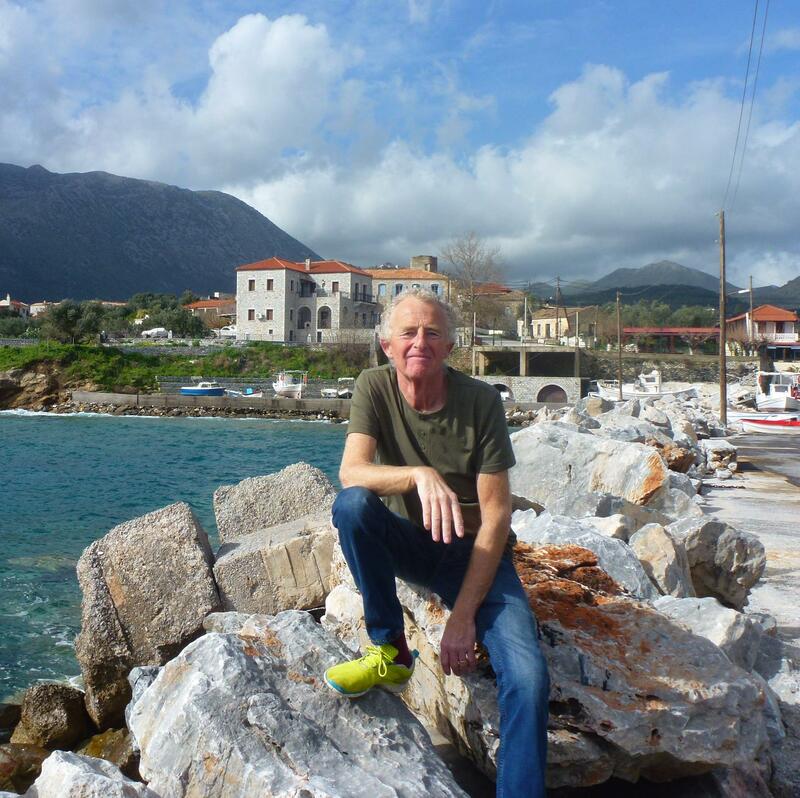 Again and again its the kindness and friendliness of the Greeks that just tips the Peloponnese into the special category for us. Up to now I have been a bit of a fan of the Byzantine churches and have struggled to resist a photo of them. This obsession has been cured as we must have seen upwards of 50 churches whilst we were driving the peninsula, at times it has seemed there are more churches than people. Add to these the ‘churches on a stick’ type shrines which were every couple of hundred metres and the time has come to admit we are all churched out. We stopped overnight in the village of Gerolimenas where we saw a handful of people, most of whom were stopped at the hotel for coffee. One of those places that is a picture postcard village around a harbour with nothing there except for maybe eight or nine tavernas, a very small pebble beach and a small mini-market. 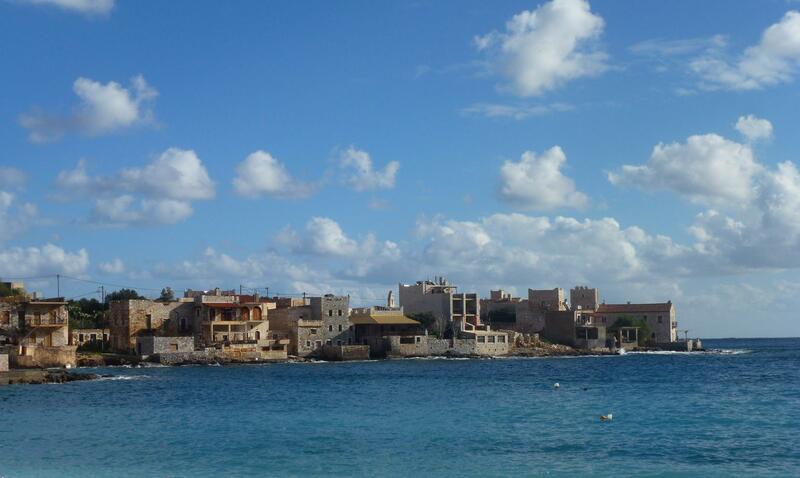 It is a relatively newish village, only built in the late 1870’s as a port where ships could offload and store cargo. Several of the old warehouses are derelict now but most of the houses are well restored and used as holiday accommodation. Having hardly seen a soul all day we parked up in a small car-park next to the harbour for the night, lo and behold there was another GB registered motorhome parked up in front of us. No one seemed to mind either of us being there but late evening the hotel did stick their generator on for the night, so much for a quiet nights sleep next to the beach for us then, it was like sleeping on a runway. 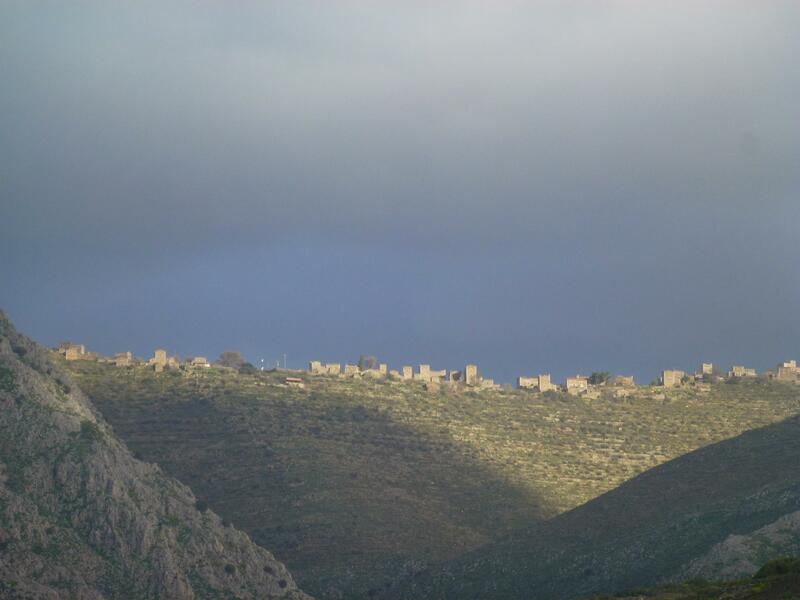 The village of Vathia is one of the most famous villages of the Mani, you can see why on the approach, it is spectacular as its perched on the side of the hill with the towers looming over the landscape. The old village is deserted but within a few feet there are some newer houses, a few mangy cats were around and a young couple camping (tent the lot) in the courtyard of one of the new builds but no one else to be seen. 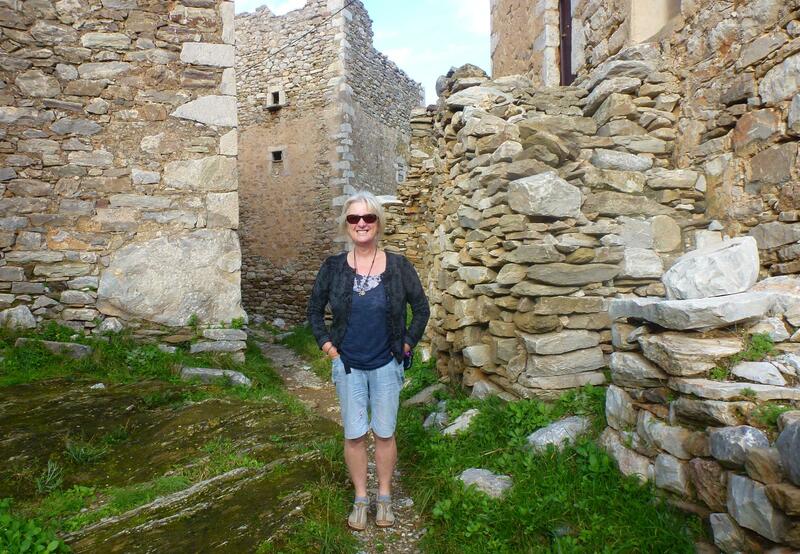 We had thought we would need to search out the fortified villages but they are everywhere. 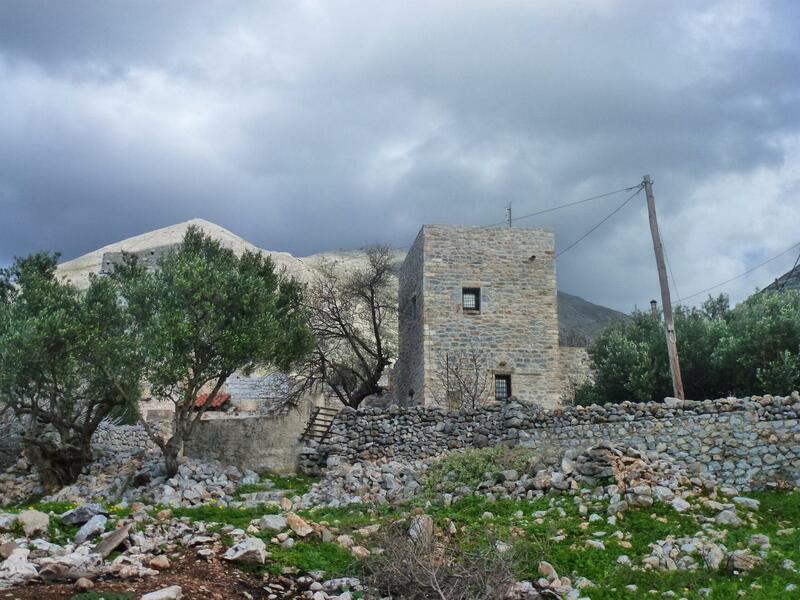 The most impressive thing to us is how they blend into the landscape, as the houses are built from stone quarried within a mile or so and the houses just disappear back into the scenery. Several people had told us that driving the Mani in a motorhome would be difficult as the roads were too narrow. We found the main road around was fine, the local bus passed us twice so its a good road despite what people would have us believe. We did find some of the roads down to villages and the harbours a little tight, but still we have not seen either a width or length restriction, it really is a case of if you can make it go for it, if you can’t then you will get stuck. Iain has better nerves than me and will take the van pretty much where he wants, whilst we are only 6 metres long I do worry about the height more sometimes as much as the length, we have had a couple of near misses with low overhanging balconies. But without the need to struggle down any of the small lanes and tracks the views are incredible. The ‘main’ road zigzags along up and down mountains, through villages and all along we found plenty of places to pull over and just admire the scenery. We reached our furthest point South today at Porto Kaigo, where there was a helpful sign for “camper parking”. Obviously the best thing to do then is blindly follow the sign, we did, straight down the beach! There was a workman building a wall at the back of the car-park who looks a little stunned to see us arrive, maybe they meant tent campers but hey ho we were in and parked. 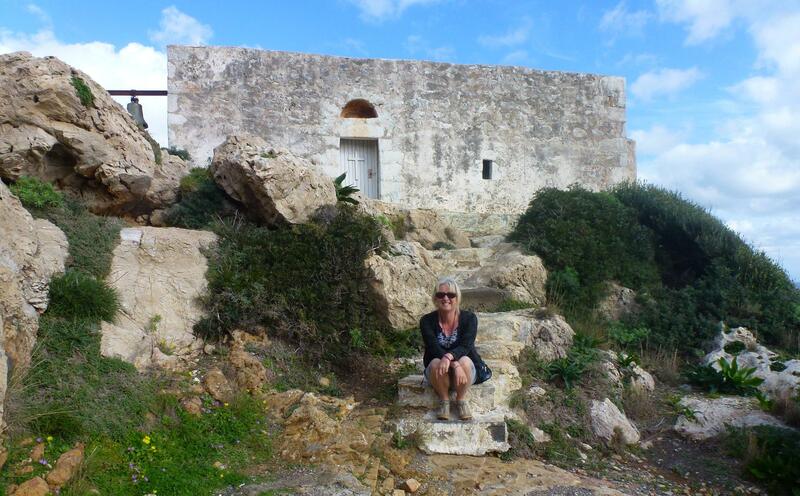 From the edge of the village there was a pathway over the hills to a teeny church, a bit Mama Mia without the steps, and then the footpath lead to the end of the Europe, well for us our very furthest point South – its pretty well North all the way for us now. 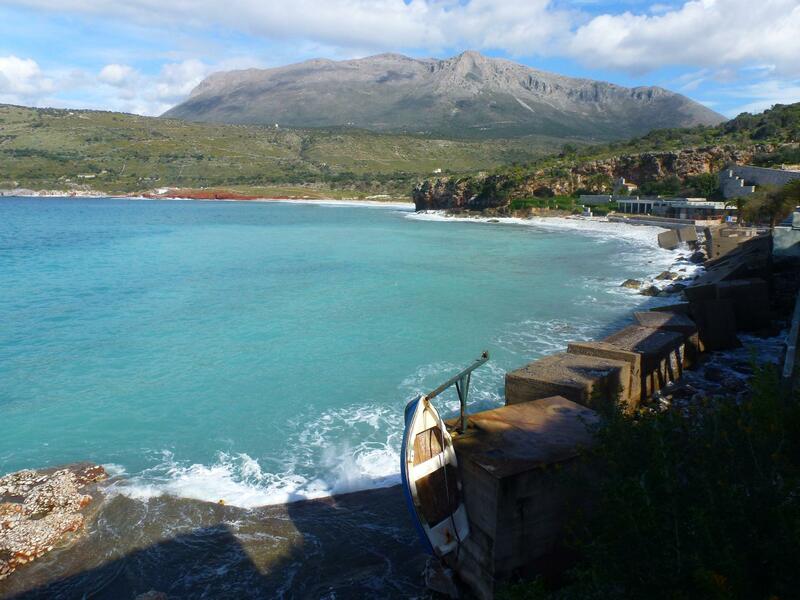 We rounded our trip off with another stop at Kotronas, for us one of the most perfect little stopping points for no reason than it has a cafe, a harbour, a jetty and the clearest and most turquoise sea we have yet to see. Back at camp and the top news is the new Kindle has arrived 🙂 there have been a few nerves as it was fours days late, reading the envelope its been in Germany for three of them for some reason. Who cares, its here now and all is well again in my world. 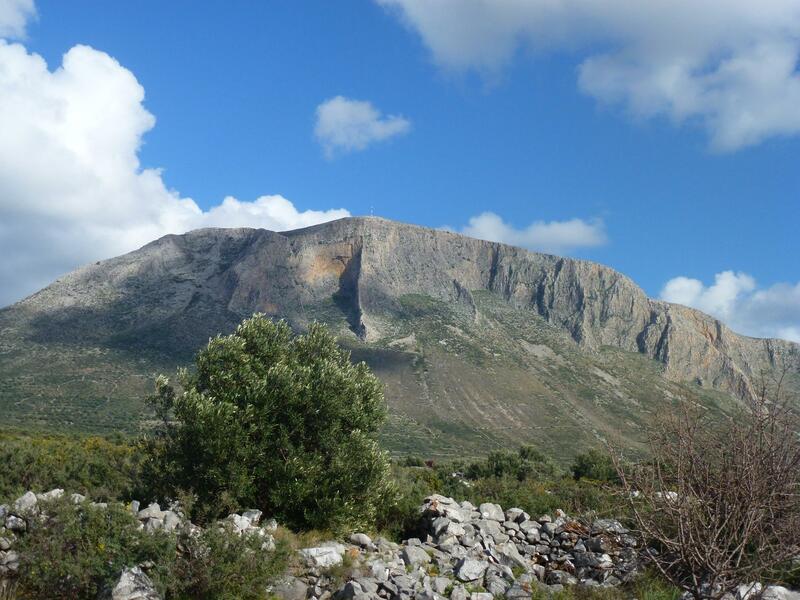 Once the whole dentist shebang is out of the way it will be time for us to move on and head for the third finger of the Peloponnese, hopefully Monday or Tuesday. We would of thought we would have seen pretty much everything we want to in the last month but there is still a list as long as your arm of things we we want to see or places we would like to visit so with the good weather forecast to be hanging around it seems a good time to move and find somewhere new to base ourselves for a few weeks. Lets see if the smile is there after a few hours of root canal work?